Queless rushed out of the Temple of Lathander and onto the streets of Waterdeep. It took him awhile to find his bearings but soon he spotted Piergeron’s Palace and some kind of commotion on the street nearby. A group of guards was gathered around something on the ground. A few people stopped and either laughed or smiled and continued on their way. As Queless drew closer he could hear Morin’s voice cursing up a storm. “Guards please give Morin, Champion of Moradin some room. Grab my arms Morin, thou art stuck!” Morin grabbed onto Queless. Queless pulled with all his might and Morin popped out of the manhole, falling on top of Queless. The two fumbled about with their gear intertwined for a few moments then finally regained their composure and stood up. “Er, yes… well this manhole was actually open.. and I er… fell in. I must watch where I am going. I was distracted because I heard news that Gemdigger Feldenswallow of the great Dwarves of the North was missing!” Morin used recent news event heard all over Waterdeep as an excuse as to why he was not paying attention. He did not want to look like a complete idiot. “Yes, well get moving along.” A Waterdhavian Guard said as he replaced the manhole cover and secured it with a couple large bolts. The guards immediately assumed their positions and quickly marched toward the stables to retrieve their horses. “Aye, take us to the Silver Lion Inn.” said Morin. Queless & Morin climbed into the rickshaw and the Velvet Champion shot off like a racehorse. The two had never traveled so fast in all their life. The City of Waterdeep became a blur and for a moment all their troubles seemed to fade away. “Just sit back, relax, and enjoy the trip.” The Velvet Champion whipped around a few corners, shooting down alleyways like a fireball. He utilized every shortcut he knew and the group arrived in the Dock Ward before the guards from Castle Ward! The first thing the group noticed when reaching the Dock Ward was the strong smell of smoke. It was Flen, the Dalelander who had tipped them off to both Aurora’s and the Piergeron’s Palace troubles. His face was white and there were two holes pierced into the side of his throat. Queless was suddenly overcome with guilt feeling somewhat responsible for this horrible turn of events. The gallop of horses could be heard down the street. Most likely the guards from Castle Ward were coming to assist. Two zombies suddenly burst out through the front door just as an explosion erupted from somewhere inside the Inn. Fire shot of the front door and caught the zombies partially on fire. The flames inside started to climb to the second story. “Tis Flen, Morin… He hath perished.” A wave of sadness washed over Queless. It didn’t come as a surprise to him though, most of the people known to him had come to violent ends. Queless then turned to the priest. The priest of Lathander looked up at Queless with tears in his eyes. “I do not fear death. I have been to the other side and graciously brought back by his grace Lord Lathander Morninglord to perform his wishes. He wishes us to give these people another chance at life, despite the smoke and flames that cloud their souls and burn their flesh. Let us go my friends, and if we die let it be quick and let Lathander Morninglord deliver us to the great beyond gracefully.” Misha Borne of the Light marched towards the inn. Queless, Morin, and Misha went around to the back side of the inn. Queless pulled his rope from his backpack. Using the grappling hook attached, he threw it through a 2nd story window. The glass shattered loudly, most likely drawing the attention of any zombies in the inn rooms above. Morin cast invisibility to undead upon Queless as he started climbing up the rope. He turned and cast the same spell upon the yellow haired young Priest Misha. Then Morin started to pray, hoping that active praying would help him gain curative magics while Queless rescued people. Misha watched as Queless reached the top and climbed through the broken glass and into the inn room above. Misha then pulled on the rope to make sure it was still secure and began to climb while Morin prayed and chanted to Moradin Soulforger God of the Dwarves below. “If only he knew the strength of the Morninglord.” Misha said while climbing. Queless emerged in a smoke filled room and started coughing violently. This was no place for the living. He looked around and realized the small room he had climbed into was his own! The door to the room had been forced open from the outside and it looked as if a struggle had taken place. A couple vases were smashed, there was blood everywhere, and all of Queless’s gear was missing! Beyond the door Queless could see flames and hear the screams of guards in the hallways, trying to evacuate and rescue patrons of the inn while fending off the horde of zombies. Queless could not get a good look, but it sounded as if there were many more zombies here than he had seen in the past 3 locations. Perhaps this was different magic than the Necromantic Pedestal and Gems performed. The moans and groans of the undead drowned out all other sounds. 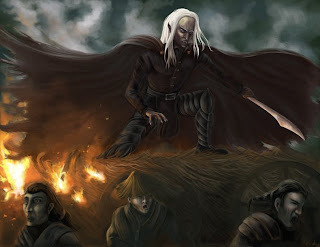 Queless could hear the screams of people being burned and guards struggling against the horde. In the distance he thought he could hear a sinister laughter and the sound of nails grating against stone, but that was probably just his imagination. Queless’s ears picked up the sound of nails against the wall. Thinking that extra help would be needed he peeked out the window and waved Morin in. He then reached into a hidden pouch and pulled out an Iridescent Spindle Ioun Stone. This magical stone allowed Queless to breathe in any condition no matter the quality or existence of air. He closed his palm over the stone and released it. It immediately floated into the air and hovered next to his head. It’s magic began to function and Queless took a breath of smoke without a problem. Misha got to the top of the rope and Queless helped pull him inside. Misha said a prayer and winked at Queless. “The air just got cleaner.” He then took a breath of fresh air from outside, turned and blew it into the inn. A huge cloud of smoke suddenly pushed out of the room and down the stairs. The air was now pure in this particular section of the inn. “Great blessings to the Morninglord” Misha said. Queless walked to the doorway and took a look around. To his left the stairs descended to the main entry hall which was now ablaze with fire. A couple guards stood amidst the flames fighting off three zombies intent on feasting upon their flesh. To the right the open walkway snaked alongside the wall next to doorways leading into other inn rooms. There were 4 such doorways visible before the walkway became enclosed and disappeared at the end of the building and continued up to the suites near the roof. Four zombies could be seen attacking something in the 2nd doorway down from Queless’s room. Someone was screaming for help higher up and flames were scattered about here and there on the walkway. Smoke was everywhere except for this small area that Misha was able to clear with Lathander’s magic. The sound of blades crashing into flesh could be heard up ahead around the corner. Chaos was erupting all around the three. The group moved onto the walkway which ran the length of the inn. Immediately they spotted a few things they had not previously noticed. First, the doors to all of the inn rooms were already open. Each inn room contained either undead or a combination of undead and guards. No folk needing assistance could be seen within the first four rooms. Calls for help and screams could be heard further up towards the suites at the top of the inn. Second, the zombies here were quite different from the groups previous expeditions in that once they were slain they did not change into a glowing, spirit-like essence and shoot off to a silver pedestal. As the guards slayed them they stayed where they fell. Queless called out to the group “It doth sound as if someone needs our help up yonder! Let us make haste!” The group charged past the patches of carpet on fire, the flailing zombies, and the busy guards. Rounding the corner and climbing the last bit of stairs the group found themselves staring at a beautiful maiden in a long yellow dress now stained with blood. Eight zombies stood around her, ripping off her ears, biting into her arms, and gnawing on her hands. The zombies were completely oblivious to the group’s presence and continued feasting upon the poor woman. A blank stare from the maiden either meant death or that complete and total shock had set in. Without hesitation Queless lifted his blade to attack. “Attack ye Fellowship of Lightning! Fair maiden we shall save ye. Have faith, it shall all be over soon!” Queless thrust his sword towards a zombie, taking his advantage over the undead by appearing invisible. His sword pierced through the zombies rotting skin and he shoved the blade deep into it’s chest cavity. The sword stuck against some bones and it took a little effort to free it. It came out with chunks of rotted flesh, writhing like worms attached. After the attack the spell became null and void and Queless found himself standing before a mob of undead who promptly dropped the woman in yellow to the floor and shuffled towards the would be heroes. Queless dropped to the ground thrusting upwards and into a zombie with his sword. He then rolled length-wise towards the zombies hoping to trip some and stopping an otherwise fearsome mob. Queless tripped two of the creatures and they hit the ground. Misha’s scepter glowed with a bright golden light and the zombies all burst into flames! They shrieked out, dropping to the ground and writhing in forms of moral pain before turning completely to ash. The woman’s body hit the ground and rolled over. Her bodily fluids were running out onto the floor, her tongue lolled in her mouth, and her eyes were wide open. She lay in a pool of her own blood and chunks of flesh. She was dead. “Let us move further into this den of evil and slay the rest of these evil-doers before they-” Misha was cut off by a huge shift in the walkway. The fire must have already caused structural damage below as the walkway suddenly dropped a couple feet and shifted, leaning to the left. If it tilted much more the heroes would be thrown over 30 feet down into the inferno below. The temperature in the inn was rising very rapidly. Morin and Misha both began to cough violently from smoke inhalation. There were four doors up ahead. The first was open, the other three were closed. These were spaced out more so than the other inn rooms. These must have been the inn’s suites. The area immediately around the group began to grow quieter by the minute. The heroes could now hear the roar of the flames, the structure creaking and falling apart, the few remaining guards clashing weapons with the last of the zombies, and the growing crowd outside. Was there anyone else to rescue? Was there indeed a Lord of the Night within the inn? If so, what was he doing out in broad daylight and where could he have escaped to if he fled this scene? Queless ran to the open door checking for any occupants. No one was in the room. The large room held an ornate vanity and old oak bed. Upon the bed was spread a woman’s fine clothing. This must have been the room that the dead maiden had been staying in. He then smashed open the window with the pommel of his sword. Fresh, breathable air flowed in as the smoke poured out. Queless smashed down the next door. Belonging were strewn about the room. It looked like someone had packed up hastily. A rope trailed from a coil on the bed up towards the ceiling where a large hole had been hacked through the roof. The markings looked like they were from an axe of sorts. Smoke trailed from the rooms below and up out the hole into the Waterdeep noontime air. The sky could be seen above, blue with a few small clouds. It looked like whoever was staying here had their own method of escape, away from the zombies and out onto the hay sewn slanted rooftop. Queless ran and jump kicked the next door. His strength and force threw the door completely off it’s hinges. Queless more or less rode the door into the room as it collapsed. This room was completely devoid of personal belongings save a note stabbed into the wall with a large black dagger. Blood dripped down the wall behind the note, presumably the dagger was used to kill some poor sod before it was used as a means to post a letter. As Queless neared the note he realized it was also written in blood. Ye shall cease your investigation immediately and leave Waterdeep permanently. Failure to do so will result in the capture and execution of every family member, friend, and acquaintance you hold dear. You have until tomorrow at sundown to exit the city. Something wet and warm dripped onto Queless’s head from above. He naturally wiped it away and looked at his hand. BLOOD. Queless looked up at the ceiling expecting the worst. A familiar face stared back at him. A halfling dressed like a pirate, but in a beggars clothes. He had a patch which had been pulled back from his face and both his eyes were torn from their sockets and hanging from a patchwork of tendons and veins looking down at Queless. His face was white and his throat slit. He looked as if he had little blood left in his small body. It was Grebble, the beggar who lived in the alley next to Vendall’s Varied Goods. This was the halfling who had tipped Queless off to the recent appearance of the Lord of the Night. Grebble was suspended above the ground, although no rope or hook held him there. He seemed to be just magically floating there, waiting for someone. Suddenly Grebble came to life and flew straight at Queless! Before Queless could react Grebble had a tight grip with both hands around his neck. Queless felt an enormous and inhuman amount of pressure being applied. He couldn’t breathe and the magical ioun stone ceased functioning and fell to the floor, rolling under the bed. Grebble opened his mouth trying to say something, but no words came out. Instead, a black gelatinous goo spewed forth from his gaping maw and reaching out like a hand for Queless’s mouth. Queless was struggling to free himself from the grip, but try as he might the halfling corpse would not let go! Morin hefted up his war hammer and slammed it into the halfling’s head. It made a loud thump, but still Grebble failed to release his grip. Misha prayed to his great god Lathander Morninglord and placed a glowing scepter upon the corpses back and still the corpse throttled Queless. The goo was reaching Queless’s mouth! Misha dexterously lept to the attack and brought his scepter flashing out and thrust it into the side of the walking corpse. The entire group was grappling with each other and collapsed on the floor. The corpse began to twitch about on the floor and stopped moving. Morin stood up and helped Queless to his feet, then brushed himself off. “It’s ceased moving. I hope it’s dead.” Morin said. “I’ll finish it off with a spell.” Misha said softly. As if sensing what was about to occur the corpse tried again to leap to it’s feet! Misha was busying kneeling in the doomed inn room, praying for Grebble’s spirit to travel quickly to the after world. Queless and Morin lowered Misha carefully all the way to the ground. Misha took off around the corner to get the grappling hook. Queless thought he could hear a faint laughter and the sound of metal grating against stone echoing from deep in the flames below. What was left of the walkway ripped completely free and fell into the inferno below. The flames grew taller and Morin and Queless began to feel the heat so that beads of sweat were dripping off of them. Queless felt faint and Morin was on his hands and knees near the window attempting to breathe. The two could barely see through all the smoke. Finally the grappling hook flew through the window. Morin grabbed it and secured it. “Let’s -cough cough- get…” Morin ceased speaking and simply started climbing down the rope. Queless followed suit. Within a minute they were safely outside just in time to see a fire wagon arrive. The guards began to run hoses to the fire and pump water out of a large metal tank on the wagon. People were yelling and running everywhere. A very chaotic scene was unfolding. There were bodies being loaded, priests praying, guards running, bystanders gaping. It was total chaos in Waterdeep. The group of heroes ran to help the guards with the hoses. After the guards got the water running the fire was put out fairly quickly. Queless helped load bodies while Morin assisted in healing the injured. Misha went in with the guards to slay any existing undead while scouring the inn for any clues. After a couple hours the scene was calm. The inn was destroyed and no one knew if the owner was planning on rebuilding. Apparently he was away to his home town of Neverwinter and would not be back for a week. A couple guards would be posted to keep people out of the dangerous burnt out building. “Misha, ye did join us willingly and performed honorably. I think I can speak for Morin saying ye are welcome in the Fellowship of Lightning. We shall get to the palace of your Morninglord on the by and by. There are still some things we must look into here before we cross town again.” Queless said. “I understand. I saw you looking at your friend as he was packed up and hauled away to the morgue. I see concern in your eyes for him and I as well have a concern which must be addressed. He was bit by the vampire and thus may become a vampire himself. For one with a good heart this can be too much to stand and will cause one to go insane and kill many. I will go to the morgue now and check on him, if he needs burial Lathander will pay his way if he was of good heart and character.” Queless and Morin agreed to this and thanked Misha for all his help. Misha bade the group farewell and headed off to the morgue. Queless and Morin went to work searching the inn for a secret passageway. The guards granted them temporary access since they helped during the fire. After a couple hours searching around the two were unable to locate anything other than a small grate in the kitchen that only a very small halfling or gnome would be able to squeeze through. Since all of the folks who were in the inn at the time were killed there were no witnesses, thus it is unknown if the undead simply entered through the front door, accessed the inn through a secret door, or were magically summoned. After all this time searching the two finally gave up. “Morin, let us head yonder to Vendall’s and see if anything queer has occurred there recently. I have a hunch.” Queless said while leaning against a blackened badly damaged counter in the inn’s kitchen. Morin agreed and added “Let’s go to Piergeron’s Palace after that and pick up our reward from mister council member.” Queless nodded and the two were off to Vendall’s Varied Goods.